Hi Everyone!! Can you believe there's only 5 months until Christmas?! 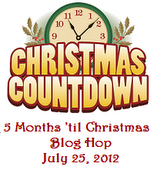 When I saw Georgiana's blog hop at Carson's Creations last month I thought what a great idea. I had to inquire and join in on all the fun. This also helps me get a head start on my holiday cards. I'm using this sentiment as my stamped image. I really like this card as it's simple but still pretty. Please be sure to visit all my crafty friends blogs and checkout their cards. I'm sure they will inspire you to get into the holiday spirit. Some have candy to giveaway!! I also have a Summer Giveaway & 200 Follower Giveaway. Isn't it amazing how many cards you can make from the Paper Dolls cartridges?? Both are great! So happy to have you on our hop team! Your cards are just fantastic! Don't you just love the Paperdoll Dress up cartridge! Love the Santa and Mrs. Claus and your stamped card is sooo pretty! Great job hun! These are so fabulous! Santa and Mrs. Claus are so adorable. Love them!! Great cards! I love Mr & Mrs Claus. So happy you could join us this month. Both of your cards are wonderful. I really like Mr. & Mrs. Claus. Glad you could join us this month for our blog hop. Hugs! Mr and Mrs Claus are so cute and I love the sentiment on the other card. Thanks for playing at BBTB2. 2 beautiful cards. I really love the Mr. & Mrs. Claus. Way too cute. Great cards. I especially love Mr and Mrs Claus. Thanks for sharing at BBTB2. love both the cards, love mr and mrs sant with the peachy keen faces. So so cute... thanks for joining us at BBTB2. I'l have to get out my Christmas stuff next. Just finishing up some baby stuff. Thanks for playing with us at 2 Sister this week. Mr and Mrs Claus are so cute!Thanks for joining us at BBTB2. Too, too cute. Don't you just love all the adorable cuts on this cart. I just received mine recently and love it. Love ur cards , Santa and mrs.claus are so cute. Thank you for your comment . These are really cute! 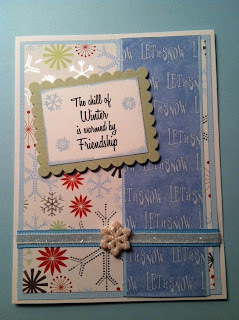 Thanks for linking up to the Simon Says Stamp Challenge Blog! What super cards! 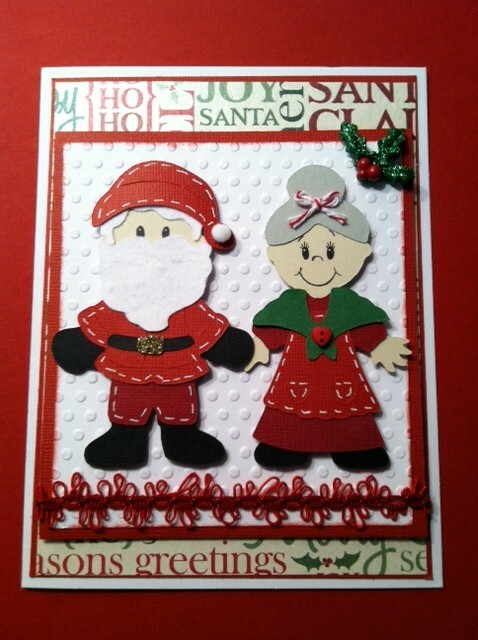 Your Mr. and Mrs. Santa one is so sweet - and the colours are perfect with the sentiment on your stamped card! Super great cards! I just love the stitching you did on their clothes on the first card! Love the cute cards! Thanks for playing at My Craft Spot.